Fleet managers across the UK should take note of the Volvo XC40, as the model has been named this year’s New Company Car of the Year at the Fleet News Awards. What’s not to love about the XC40? Standout features of the XC40, according to the Fleet News judges, include the outstanding quality of build, low running costs and attractive styling. It was for these reasons that the XC40 overcame its competition in the New Company Car category. Pilot Assist driver assistance features, including adaptive cruise control, rear cross-traffic alert, blind-spot monitoring and 360-degree camera system, all come as standard on the model. 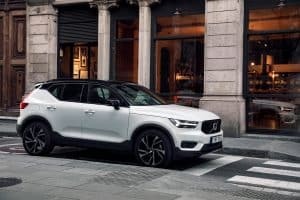 At the same time, it features an in-built infortainment package utilising a nine-inch touchscreen and sophisticated voice-control system, as well as the manufacturer’s Volvo On Call connected services. The XC40 also received a prestigious five-star safety rating from Euro NCAP. Fleet News editor Stephen Briers stated: “The XC40’s adaptability made it a winner for the fleet decision-makers. Steve Beattie, head of business sales at Volvo Car UK, added the win is “particularly valuable”, given the fact that this one category exclusively voted for by fleet decision-makers.